It's Tuesday so that means we're having tacos for dinner! There's something about Taco Tuesday that makes you feel like it's the weekend. And we all know we need that feeling during the week! So pull out the chips & salsa, mix up some of my Blood Moon Margarita's & let's celebrate the day. Lentils are a must have in my pantry. Ella loves them plain, but I love to add them to soups, salads, burrito bowls and tacos! The first time I had green lentils from Trader Joe's I was like dang these would make the perfect vegan "taco meat." They have a nutty, hearty flavor & their small size gives just the right texture for a taco. Packed with protein, iron & naturally gluten free lentils are a great addition to many meals! Let's start by preparing the lentils. This can totally be done ahead of time and can be kept in your fridge for up to a week! In a medium sauce pan bring contents to a boil. Reduce heat to low and simmer with the lid on until lentils are tender and most of the liquid is absorbed, approx 30-40 minutes. This will make a decent amount so I like to leave them plain and serve with their natural flavor so I can use the leftovers in various ways the rest of the week. Next we will make some seasoned beans, this is where the taco spices come in. Feel free to use a taco seasoning packet or make your own! You can also sauté some onions before you add the beans to the skillet. Do your thing! 2 cans of beans, I like to use 1 can pinto, 1 can black beans or white beans. But you can mix it up! Drain the liquid from both cans of beans, but do not strain. Add seasoning and heat on medium-low heat for 10-15 minutes. Add broth or water and stir to make it a little saucy. I used soft Whole Wheat Tortilla's for my shell. But you can use hard shells, turn it into a taco salad or a burrito bowl with some rice! Heat up your tortilla shell on a skillet or place in the microwave for 20 seconds. 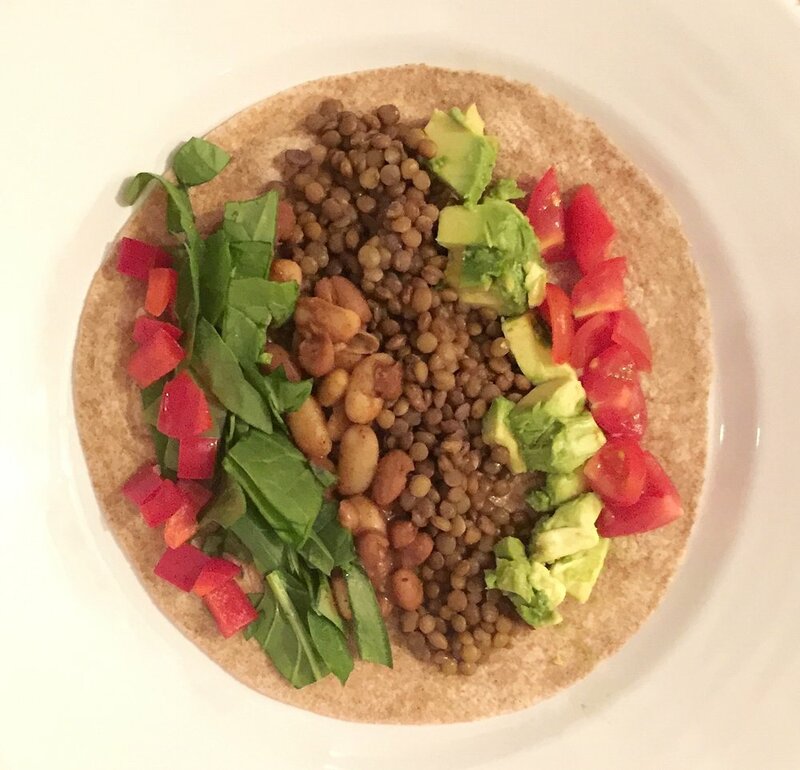 Scoop on some lentils and beans & top with your toppings of choice. This is such a simple and healthy dish! You definitley won't feel guilty going back for seconds...or thirds!